Yes, to a large extend, quacks make a living by advertising lies. A paper just published confirms our worst fears. This survey was aimed at identifying the frequency and qualitative characteristics of marketing claims made by Canadian chiropractors, naturopaths, homeopaths and acupuncturists relating to the diagnosis and treatment of allergy and asthma. A total of 392 chiropractic, naturopathic, homeopathic and acupuncture clinic websites were located in 10 of the largest metropolitan areas in Canada. The main outcome measures were: mention of allergy, sensitivity or asthma, claim of ability to diagnose allergy, sensitivity or asthma, claim of ability to treat allergy, sensitivity or asthma, and claim of allergy, sensitivity or asthma treatment efficacy. Tests and treatments promoted were noted as qualitative examples. The results show that naturopath clinic websites had the highest rates of advertising at least one of diagnosis, treatment or efficacy for allergy or sensitivity (85%) and asthma (64%), followed by acupuncturists (68% and 53%, respectively), homeopaths (60% and 54%) and chiropractors (33% and 38%). 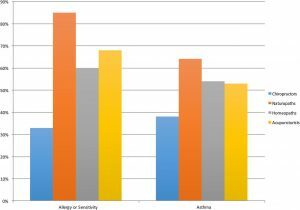 Search results from Vancouver were most likely to advertise at least one of diagnosis, treatment or efficacy for allergy or sensitivity (72.5%) and asthma (62.5%), and results from London, Ontario were least likely (50% and 40%, respectively). Of the interventions advertised, few are scientifically supported; the majority lack evidence of efficacy, and some are potentially harmful. The authors concluded that the majority of alternative healthcare clinics studied advertised interventions for allergy and asthma. Many offerings are unproven. A policy response may be warranted in order to safeguard the public interest. This survey originates from Canada, and one might argue that elsewhere the situation is not quite as bad. However, I would doubt it; on the contrary, I would not be surprised to learn that, in some other countries, it is even worse. Several national regulators have, at long last, become aware of the dangers of advertising of outright quackery. Consequently, some measures are now beginning to be taken against it. I would nevertheless argue that these actions are far too slow and by no means sufficiently effective. We easily forget that asthma, for instance, is a potentially life-threatening disease. Advertising of bogus claims is therefore much more than a forgivable exaggeration aimed at maximising the income of alternative practitioners – it is a serious threat to public health. We must insist that regulators protect us from such quackery and prevent the serious harm it can do. Alternative medicine suffers from what might be called ‘survey overload’: there are far too much such investigations and most of them are of deplorably poor quality producing nothing of value except some promotion for alternative medicine. Yet, every now and then, one finds a paper that is worth reading, and I am happy to say that this survey (even though it has several methodological shortcomings) belongs in this category. This cross-sectional assessment of the views of general practitioners towards chiropractors and osteopaths was funded by the Department of Chiropractic at Macquarie University. It was designed as a quantitative descriptive study using an anonymous online survey that included closed and open-ended questions with opportunities provided for free text. The target population was Australian general practitioners. Inclusion criteria included current medical registration, membership of the Royal Australian College of General Practitioners and currently practicing as a general practitioner in Australia. The data being reported here were collected between May and December, 2014. There were 630 respondents to the online survey during this period representing a response rate of 2.6 %. Results were not uniform for the two professions. More general practitioners believed chiropractic education was not evidence-based compared to osteopathic education (70 % and 50 % respectively), while the scope of practice was viewed as similar for both professions. A majority of general practitioners had never referred a patient to either profession (chiropractic: 60 %; osteopathy: 66 %) and indicated that they would not want to co-manage patients with either profession. Approximately two-thirds of general practitioners were not interested in learning more about their education (chiropractors: 68 %; osteopaths: 63 %). The authors concluded that this study provides an indication of the current views of Australian general practitioners towards chiropractors and osteopaths. The findings suggest that attitudes may have become less favourable with a growing intolerance towards both professions. If confirmed, this has the potential to impact health service provision. The results from this cross-sectional study suggest that obtaining representative general practitioner views using online surveys is difficult and another approach is needed to supplement or replace the current recruitment strategy. a mixture of the above factors. Whatever the reasons are, the finding that there now seems to be a growing scepticism (in Australia, but hopefully elsewhere as well) about the value of chiropractic and osteopathy is something that cheers me up no end. According to the ‘General Osteopathic Council’ (GOC), osteopathy is a primary care profession, focusing on the diagnosis, treatment, prevention and rehabilitation of musculoskeletal disorders, and the effects of these conditions on patients’ general health. Using many of the diagnostic procedures applied in conventional medical assessment, osteopaths seek to restore the optimal functioning of the body, where possible without the use of drugs or surgery. Osteopathy is based on the principle that the body has the ability to heal, and osteopathic care focuses on strengthening the musculoskeletal systems to treat existing conditions and to prevent illness. On a good day, such definitions make me smile; on a bad day, they make me angry. I can think of quite a few professions which would fit this definition just as well or better than osteopathy. What are we supposed to think about a profession that is not even able to provide an adequate definition of itself? Perhaps I try a different angle: what conditions do osteopaths treat? The GOC informs us that commonly treated conditions include back and neck pain, postural problems, sporting injuries, muscle and joint deterioration, restricted mobility and occupational ill-health. This statement seems not much better than the previous one. What on earth is ‘muscle and joint deterioration’? It is not a condition that I find in any medical dictionary or textbook. Can anyone think of a broader term than ‘occupational ill health’? This could be anything from tennis elbow to allergies or depression. Do osteopaths treat all of those? One gets the impression that osteopaths and their GOC are deliberately vague – perhaps because this would diminish the risk of being held to account on any specific issue? The more one looks into the subject of osteopathy, the more confused one gets. The profession goes back to Andrew Still ((August 6, 1828 – December 12, 1917) Palmer, the founder of chiropractic is said to have been one of Still’s pupils and seems to have ‘borrowed’ most of his concepts from him – even though he always denied this) who defined osteopathy as a science which consists of such exact exhaustive and verifiable knowledge of the structure and functions of the human mechanism, anatomy and physiology & psychology including the chemistry and physics of its known elements as is made discernable certain organic laws and resources within the body itself by which nature under scientific treatment peculiar to osteopathic practice apart from all ordinary methods of extraneous, artificial & medicinal stimulation and in harmonious accord with its own mechanical principles, molecular activities and metabolic processes may recover from displacements, derangements, disorganizations and consequent diseases and regain its normal equilibrium of form and function in health and strength. This and many other of his statements seem to indicate that the art of using language for obfuscation has a long tradition in osteopathy and goes back directly to its founding father. What makes the subject of osteopathy particularly confusing is not just the oddity that, in conventional medicine, the term means ‘disease of the bone’ (which renders any literature searches in this area a nightmare) but also the fact that, in different countries, osteopaths are entirely different professionals. In the US, osteopathy has long been fully absorbed by mainstream medicine and there is hardly any difference between MDs and ODs. In the UK, osteopaths are alternative practitioners regulated by statute but are, compared to chiropractors, of minor importance. In Germany, osteopaths are not regulated and fairly ‘low key’, while in France, they are numerous and like to see themselves as primary care physicians. And what about the evidence base of osteopathy? Well, that’s even more confusing, in my view. Evidence for which treatment? As US osteopaths might use any therapy from drugs to surgery, it could get rather complicated. So let’s just focus on the manual treatment as used by osteopaths outside the US. the fact that there are several groups of researchers that produce one positive result after the next. The large effect size for short-term efficacy of OMT was driven by stable responders who did not relapse. Osteopathic manual treatment has medium to large treatment effects in preventing progressive back-specific dysfunction during the third trimester of pregnancy. The findings are potentially important with respect to direct health care expenditures and indirect costs of work disability during pregnancy. Severe somatic dysfunction was present significantly more often in patients with diabetes mellitus than in patients without diabetes mellitus. Patients with diabetes mellitus who received OMT had significant reductions in LBP severity during the 12-week period. Decreased circulating levels of TNF-α may represent a possible mechanism for OMT effects in patients with diabetes mellitus. A larger clinical trial of patients with diabetes mellitus and comorbid chronic LBP is warranted to more definitively assess the efficacy and mechanisms of action of OMT in this population. The only consistent finding in this study was an association between type 2 diabetes mellitus and tissue changes at T11-L2 on the right side. Potential explanations for this finding include reflex viscerosomatic changes directly related to the progression of type 2 diabetes mellitus, a spurious association attributable to confounding visceral diseases, or a chance observation unrelated to type 2 diabetes mellitus. Larger prospective studies are needed to better study osteopathic palpatory findings in type 2 diabetes mellitus. OMT significantly reduces low back pain. The level of pain reduction is greater than expected from placebo effects alone and persists for at least three months. Additional research is warranted to elucidate mechanistically how OMT exerts its effects, to determine if OMT benefits are long lasting, and to assess the cost-effectiveness of OMT as a complementary treatment for low back pain. Based on this brief review of the evidence origination from one of the most active research team, one could be forgiven to think that osteopathy is a panacea. But such an assumption is, of course, nonsensical; a more reasonable conclusion might be the following: osteopathy is one of the most confusing and confused subject under the already confused umbrella of alternative medicine.